What is Ovi? What does "Ovi" mean? Ovi is the Finnish word for "Door" or "Gateway", and it is the brand used by Nokia for their online services, based around the ovi.com website. As well as Ovi Store, there are also many other services such as Ovi Share, Ovi Maps, Ovi Mail and more. The idea of ovi.com is to allow people to access all these services using a single Ovi username. N-Gage is still using separate usernames, but it is expected to merge into the Ovi system at some point in the near future. It's the online content shop for Nokia's mobile phones and smartphones. It sells applications, games, ringtones and more, all as direct downloads straight onto the phone through Wi-Fi/WLAN or the phone network. How do I access Ovi Store? - On your phone's Ovi Store application, indicated by a blue icon that looks like a shopping bag (see the image below). 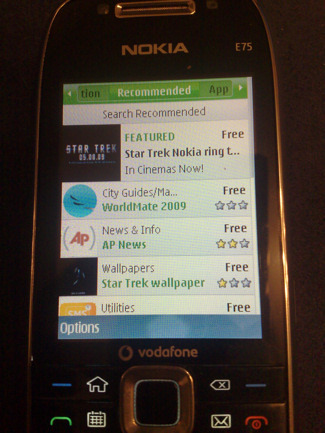 Some phones come with the Ovi Store application built into them, but some phones may require you to install the application yourself. You may be able to do this through the Download! icon, or you may be able to get the Ovi Store app by visiting the Ovi Store website on your phone's web browser. I thought Ovi Store was cancelled? No. This rumour was down to a misunderstanding by some parts of the media, where two totally separate Nokia services with very similar names were mixed up. How much does Ovi Store content cost? Most games cost about 1 to 5 euros each. Some games are cheaper, some are more expensive. However the prices of games are set by the publishers, so technically the games can cost anything. Yes, there are some freeware games. You can pay by credit card, debit card, or phone bill. Some phone network operators may not offer the phone bill payment option though. Which games are available on Ovi Store? You can see a complete list of Ovi Store games in our Ovi Store Games section. Not all games are available on all phone models, visit the Ovi Store website to find out which games are available for your phone. I can't find what I want on Ovi Store, but I know it's there! If you're searching Ovi Store from your PC, make sure you've selected your phone from the front page, as some games will only appear when you've selected a particular phone. If you're still having problems, it may be because Ovi Store's official search engine is a bit, erm, quirky. I bought a game for my touchscreen Nokia phone but it only uses half the screen. How do I make it use the whole screen? If the game you bought is full screen-compatible but doesn't automatically use the full screen. Who makes the games, apps and other content on Ovi Store? Is it all made by Nokia? Over 99% of the content on Ovi Store has absolutely nothing to do with Nokia. You can tell who is responsible for an item on Ovi Store by looking for the name of its publisher (for example the publisher of Tetris is Electronic Arts). If you don't like a particular item, you need to give your feedback to the publisher, not to Nokia. It's the publisher that controls an item, and only the publisher can take action to fix any problems with their items. Is Ovi Store just for Nokia's smartphones? Is Ovi Store just for Symbian? Ovi Store is for all of Nokia's supported devices and platforms: phones, smartphones and whatever else they come up with in the future. Ovi Store has software for many different platforms including Java J2ME, Symbian S60 and Flash Lite. It's likely that Nokia will also start offering Linux Maemo software on Ovi Store too as they bring new Linux Maemo-based devices to the market. Which phones does Ovi Store work with? Is there an Ovi Store compatibility list? Ovi Store should be compatible with most Nokia devices including their Series 40 phones and Symbian S60 smartphones. As we said before, note that not all Ovi Store games are available on all phones! Ovi Store will automatically hide games which are not available for a particular phone, so different phone models may show different selections of games available in Ovi Store. 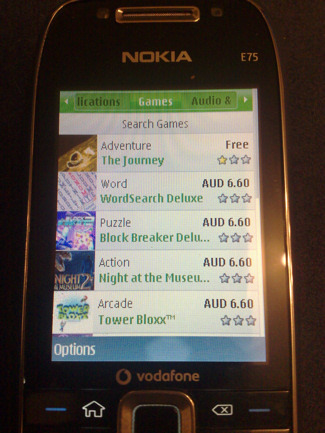 The more recent Nokia smartphones will generally have more games available than other models, as smartphones are compatible with lots of software platforms (Java, Flash and Symbian). You can check which games are available on particular models by going to the Ovi Store site on your computer and selecting a particular phone. The official compatibility list on the Ovi Store site currently includes the following phones. We've done some videos showing how to install Ovi Store, they're linked next to the relevant model. If you can't see a link next to your phone model, try watching a video for another phone as the installation methods used are very similar. If you already have an Ovi Store icon on your phone's menu system, you don't need to install anything, you can just click on the icon to launch Ovi Store. Will Nokia's Maemo Linux devices (aka the Internet Tablets) ever get Ovi Store? Possibly, but not right now. According to unconfirmed rumours, Ovi Store may be added to Nokia's upcoming new Maemo Linux device(s) at the end of 2009. Which currency is Ovi Store content sold in? In countries where Ovi Store has fully launched, the local currency is used (for example the UK store uses British Pounds). In countries where Ovi Store hasn't yet fully launched, an international version of Ovi Store using Euros is available. Which countries is Ovi Store available in? The international version of Ovi Store should now be available in most countries, and there are also local versions appearing too which have local language and local currency options. If you want to find out if Ovi Store is available in your country, go to store.ovi.com on your phone's web browser. Who can publish on Ovi Store? Any company or self-employed individual. You'll need a tax or VAT identification number for the registration process, your local tax office should be able to help you get such a number if you don't already have one. How do I publish my application or other content on Ovi Store? You can apply to become an Ovi publisher by going to publish.ovi.com. If you're accepted, you'll be able to upload your content onto the Ovi Store website and set payment details.